One of the things you notice when you do a stint of enforced retirement like I have is that during weekdays, and after rush hour and school starts, the only people driving around are contractors, like plumbers and electricians, and older folks. That’s it. Early Saturday is the same way. The geriatrics like to start early I suppose because they don’t sleep anymore. Even the stay at home moms aren’t out in force yet. Now when I say older, I mean 70+ and not just because I might be pushing this in a few short years, but because most people seem to have it together physically and mentally until this time. Oh sure we all know octogenarians that are full of vim and vigor and really don’t seem as old as they are. These are usually the ones that looked after their health all along or just had good genes or both. So obviously this is a generalization but one where the exception just confirms the rule. The highways are relatively empty at this early time of day, after rush hour, except for otr trucks and said contractors, but these older folks are still a real road hazard. They are going 50 in a 70 mph speed zone and in the middle lane. Trucks bear down on them with reckless abandon and pass them like they are standing still in the right-most lane. Usually gramps seems clueless that he was just a breath away from crushed metal jack-knife hell. The other things they are good at is the blinker-less lane change into a faster congested lane, or my favorite: the last second signal-less merge at 45 mph. At no time did you see grandpa check that blind spot from his Crown Vic. They are also good at stopping right at the end of the entrance ramp nearly causing a pile-up and forcing you to eventually perform the Big Daddy Don Garlitz merge. 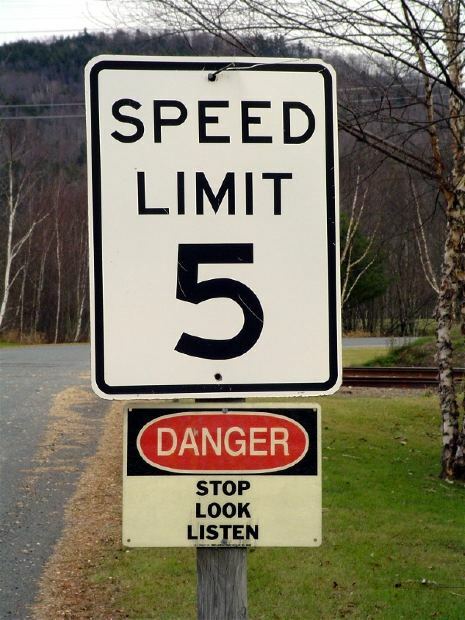 Another fav is slowing down to 30 mph as soon as they see the sign for their exit even if it says 2-1/4 miles to go. No blinker here either. When you’ve spent the morning toodling around like I have on various errands (or looking for a job), you learn to look out for these drivers. Truck drivers I suppose are used to spotting them. Most of them like to drive these big roomy tanks that hearken back to the days of cheap gasoline. A pristine one is a sure give away. Buicks, nobody but pawpaw drives a Buick. And anything big with handicapped plates or one of those hang down from the mirror tags should be on your radar. There are exceptions so be vigilant. If that car in front of you seems to be coming up way too quickly, get ready now for the lane maneuver. We love these older folks, unlike teenagers and drunks, they pull on our heartstrings. Nobody wants to pull road rage on gampa no matter how foolishly he is driving. Using the horn is just going to make a bad situation worse and will have no long term effects on his driving habits; it’s just to make you feel better. Don’t be so selfish. What are we going to do about this? If a teenager or you or I were driving like this the local sheriff’s blue light would be going on and we’re taking the breath test. (Not me, I’m a tail gating, lane changing maniac but I also have a death grip on the turn signal arm.) After studying this in my usual deep way I have determined that the problem is the automatic renewal of the driver’s license every 5 years; the driver’s test should be made mandatory to renew your license. 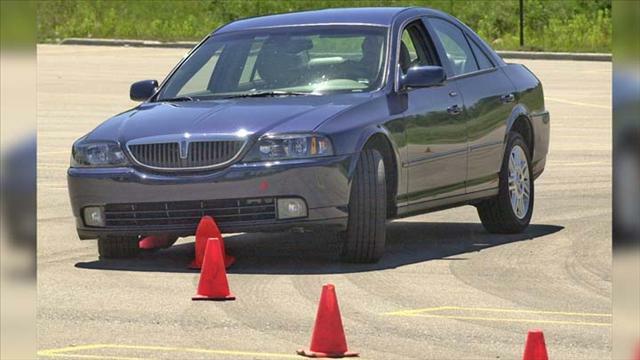 Now you or I are going to have enough trouble passing the driving portion of the test so no way is pappy not going to knock over the parallel parking cones and in addition that turn signal-less driving habit is going to be frowned upon by the tester. Never checking your blind spot, whether it’s forgetfulness or just not being physically capable, is also going to draw some low marks. If she gets on the wrong ramp, forget it. In short, no way is grandma passing this thing even if she can pass that lame eye test (Why only the eye test to renew? At least give the written test again.). So now to the next conundrum: do we make everyone take the test again or just those seventy and over? People are going to scream “age discrimination” all over the place if we only make the seniors do it, but there are plenty of precedents for age discrimination in our society that seem to go unnoticed. If you are under 18 you can’t be in the park after 10 pm or smoke (right!). You can’t drink until you are 21 even though you can go die in Afghanistan. You can’t draw social security until you’re 65. You can’t draw from your own IRA without a penalty until you are 59-1/2. Your insurance rates are dependent on your age. We age discriminate all the time and nobody seems to notice or care. The “greater good” argument doesn’t hold water either because I can prove this is also for the greater good. So now you are going to say that grandpa isn’t going to be able to “get around” anymore. Is the lack of a decent public transport system an excuse for putting the public welfare at risk? Drunks and chronically bad drivers lose their license. Why aren’t we worried that lack of a decent bus service means they can’t get to their job anymore? Let’s face it, granny’s motor reflexes and eyesight are still worse than mine after I’ve drilled six tequila shooters on an empty stomach. Should I be allowed to drive then? I don’t think so. In spite of all this we can take the discrimination issue right out of the picture, just make everyone take the driving test every five years. 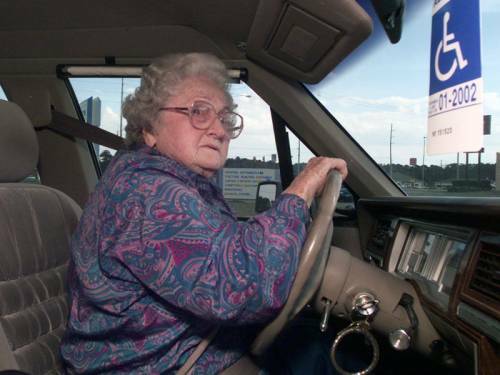 Heaven knows there are a whole set of non-geriatric drivers that shouldn’t be out there. Make them take the bus for awhile and I bet their road skills get a whole lot better too. Anyway I’ve gotta go since I’m supposed to take my Mom to the DMV to get her license renewed. I won’t do the right thing and tell her she shouldn’t be driving anymore and we’re not going to let her renew her license much less have the keys. No we’re too nice for that. If anything we’re going to lie and pretend we forgot to take her over to the DMV in time for her renewal and hope she doesn’t have it together enough to figure out that we did it on purpose.